Feeling overwhelmed about diving into the world of macro counting? In this episode I break it down into 6 simple steps that will take you from macro newbie to macro ninja. Just need to set your macros? Go here to download my free guide to setting your own macro goals. Don't know how to listen to podcasts? I got you girl. Open the purple “Podcast” app on your phone! If you have an iPhone, it should already be loaded on your phone. If you aren’t an iPhone person, you can download the apps Spotify, Stitcher, or Overcast and search for “Biceps After Babies Radio” to listen. Once that purple app is opened, hit the magnifying glass “Search” icon in the lower right-hand corner of your screen. Type in “Biceps After Babies” and you should see my smiling face sitting cross-legged in black workout clothes and my name below it! Once you click on my show, it will load and you’ll see a purple button that says “SUBSCRIBE” below my name! Click that! You’ll be all set and see a “subscribed” and a big check mark on your screen! Now each week you will get the newly released episode downloaded to your phone to listen wherever. NOW, if you’re feeling even more generous, scroll down to ratings and reviews and take 2 minutes to submit a review! This helps my brand new show tremendously! Great podcast!! I’ve listened to the first two episodes so far. How do I leave a review with an android phone?…I listen through my google music. Unfortunately it’s just through iTunes so as an android user you can’t. But thank you for listening Melissa! The best thing you can do since you can’t leave a review is to share it! In this episode you mention if we get the download you have 3 tips for weighing food and a bunch of options for tracking apps/websites as well as a bunch of tips to help with My Fitness Pal. I am not seeing this stuff? If I look st the download on my computer instead of my phone is there different stuff? Please help! I am just starting this Macros journey and know your tips will be helpful! Thank you! 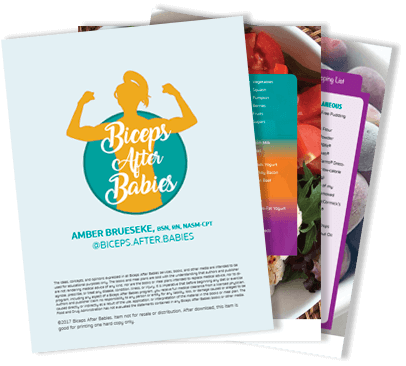 If you download the freebie with this episode (click the box that says “Get Amber’s Free Download: How to Get Started Tracking Macros”) and open it up it has all that info inside. Just enter your email and the download will be sent to you.